As I am re-acclimatizing to Santa Fe life and the art world in general I want to mention some thoughts of returning home. Many of us travel and it is the one case where you can go home again! Some travel to the other side of the world, others cross a continent and some just drive an hour from the beach. In all cases it requires some adjustment. Our trip home from Hawaii was, in travel time, just about 10 hours but it was a red eye which is not pleasant for anyone. 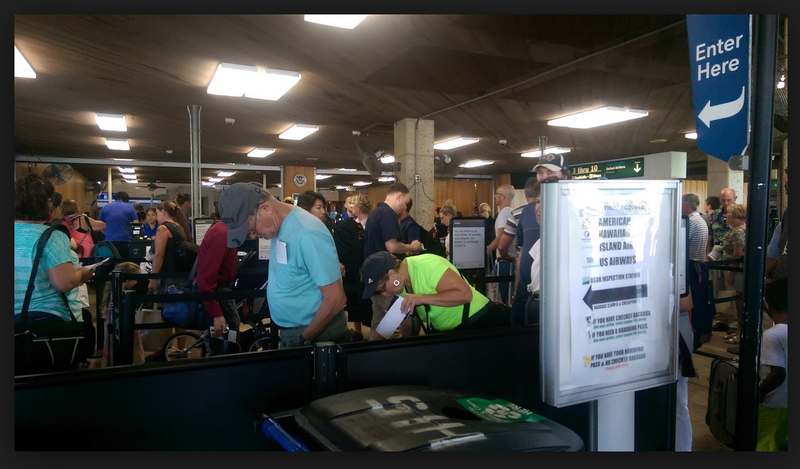 There is, of course, the need for an early arrival at the airport which in Kauai was quite unpleasant. There are separate inspections for security and two more for agriculture. Since we were flying to the mainland we were told to be at the airport 2 hours ahead of the 10:00 p.m. flight. The airport was stifling with no air-conditioning or fans, and, as this is a family vacation spot, there were overtired, screaming children. There was no notice of our flight as other flights appeared on the board. Suddenly a loud speaker announcement came that our flight was at the other end of the terminal and we rushed to arrive at a mob of people with no organization what so ever. Of course, there is the layover time between the two flights needed for our journey. Since we had been up for 14 hours before the flight by the time we were done we had been up for 29 hours. A short nap was required on arrival home. Because you need to readjust to local time, you cannot sleep too long. The following day, having slept all night and then some, there is a good chance that re-adjustment will remain elusive as it did for me. As I am writing this I see an email from an old friend referring to my second Hawaii Missive. He writes, “You say you went back to reality? That was unwise. How long before you can get out of there and back to Santa Fe?” I received another email that said, “Santa Fe must seem dry and dull after Kauai!”. Let me try to reply to both at the same time We have been having quite a bit of rain since our return breaking Santa Fe’s awful drought. As for being dull, we live in such an arts mecca, --it is never dull! A few days after we returned from our trip we went to the fabulous outdoor Santa Fe Opera where we saw Leonard Bernstein’s, “Candide”. I won’t try to give a revue but let me say I quite disagreed with the local critic who panned both the opera and Mr. Bernstein who had written some very melodious music. We seem to want our opera to be heavy and serious, with music difficult to hum. This, on the contrary, was the definition of a comic opera with wonderful singers. 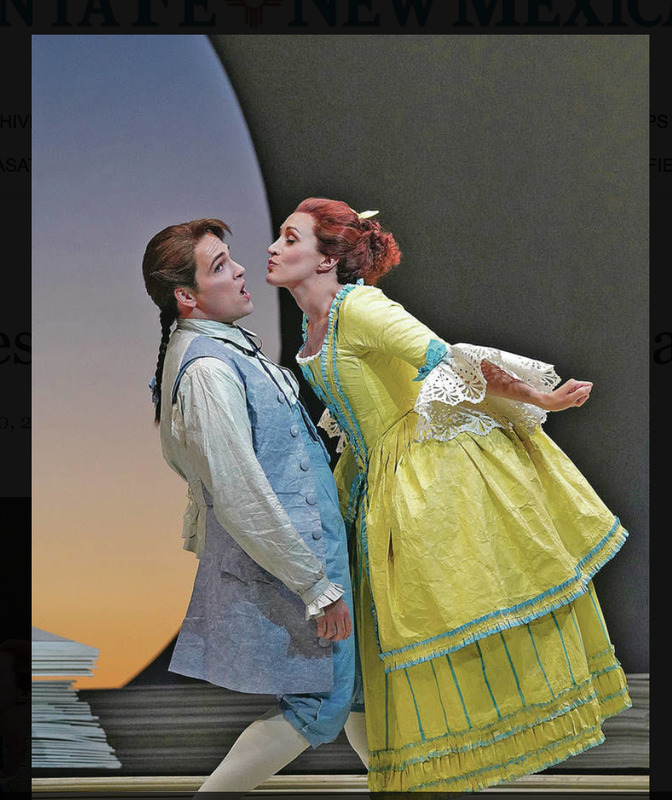 Alek Shrader and Brenda Rae in Candide at Santa Fe Opera. The following day our new mayor, Alan Webber, who has taken both praise and abuse in our local paper, invited us to a pot luck garden party he gave as a thank you for all those who had worked on his campaign. Penelope had made phone calls, canvassed and carried a poster at the gates of a polling place on election day and I had arranged a meet and greet for the prospective mayor. There must have been around a hundred people who had all contributed to the Mayor’s success. The pot luck food was wonderful with people binging fried chicken, roast beef, turkey, meat balls, corn muffins and a myriad of salads. Additional catering was done by Youth Works, a local not-for-profit that helps younger folk who are trying for their GED’s with academic coaching and vocational training. An award-winning chef known as Chef Carmen and his wife Penny Rodriguez, who had owned their own catering company, head the Youth Works catering program. So, with the latter as guides the young people baked delicious deserts and acted as wait staff for the mayor’s event. They also participated in the car shuttle to and from a nearby church to his home. Everyone had opportunities for their one on one with “His Honor” and he gave a brief speech, jokingly taking credit for the recent rains. Needless to say, after he was finished the heavens opened and there was a wonderful downpour! As an added bonus we were all urged to take home left overs, so further samples from the buffet rounded out our dinner. In reply again, to my first emailer, we have re-found Santa Fe!